In Word 2010, most images stay with the text they’re near. When you edit text in your Word document, the image shuffles up or down on the page to be near the original text it was placed in. But you can make an image stay put, even when the text around it is moving. 2From the Format tab, in the Arrange group, choose Text Wrapping→More Layout Options. 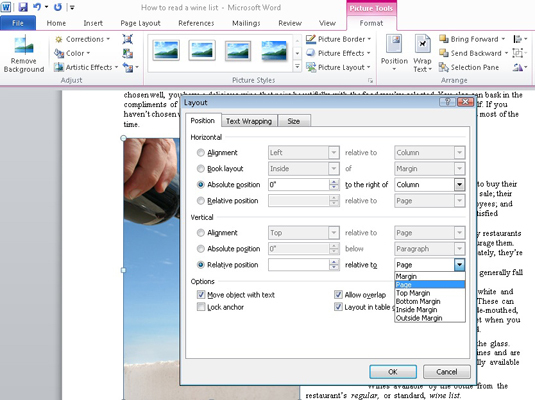 The Advanced Layout dialog box appears. From the Horizontal area, select Absolute Position. 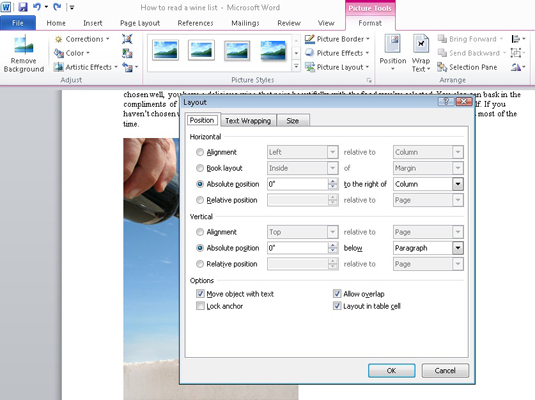 4Select Page from the To the Right Of drop-down list. From the Vertical area, select Absolute Position. 5Select Page from the Below drop-down list. Your image is free of its text-related shackles. This trick works best (but not exclusively) with objects placed behind your text. It makes the graphic or image appear to be part of the paper.